Rabbi Weiner initially came to Cedars-Sinai to serve as the Jewish chaplain. He previously had been the assistant rabbi at Young Israel of Century City in West Los Angeles. Rabbi Weiner has earned rabbinic ordinations from Yeshivat Chovevei Torah rabbinical school and Rav Zalman Nechemia Goldberg in Jerusalem. He has a master’s degree in bioethics and health policy from Loyola University, where he is currently completing a doctorate in clinical bioethics, and another master’s degree in Jewish history from Yeshiva University. 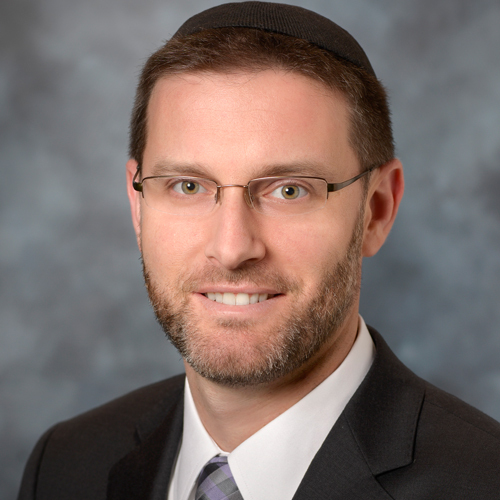 Rabbi Weiner has also completed four units of clinical pastoral education and is a board certified chaplain through Neshama: Association of Jewish Chaplains, and he currently sits on their board. Rabbi Weiner serves as president of the Southern California Board of Rabbis and has been honored with Rabbinic Leadership Awards from the Orthodox Union and Chai Lifeline. He is a member of the Cedars-Sinai End of Life Committee, the Organ Donor Council and the Bioethics Committee, where he serves on its internal advisory board. Rabbi Weiner is also the Rabbi of Knesset Israel Synagogue in Los Angeles’ Pico/Robertson neighborhood, he teaches Talmud and Jewish medical Ethics at Shalhevet High School, and he frequently serves as a scholar-in-residence at conferences and synagogues throughout the nation on topics related to Jewish medical ethics, pastoral care, health and wellness. He is the author of Guide to Observance of Jewish Law in a Hospital (Kodesh Press) and Jewish Guide to Practical Medical Decision Making(Urim) and has published more than two dozen scholarly articles and book chapters, as well as a number of “popular” pieces.